While a handful of blackberries make a tasty summer treat, tea made from blackberry leaves and parts of the berry may also have health benefits ranging from antioxidant benefits from the anthocyanocides it contains to cancer treatment. Drinking blackberry tea can also have side effects, although they're generally mild. Little clinical research has been done on blackberry tea; most information comes from anecdotal evidence. Do not drink large amounts of blackberry tea without talking to your doctor first. Although used by alternative medical practitioners to treat diarrhea, blackberry tea in large doses can also cause stomach upset, including nausea and vomiting. Asian populations that consume large amounts of all types of tea have an increased risk of stomach cancer, although this does not occur in Great Britain, where citizens also consume large amounts of different teas. The difference may be that Britons add milk to the tea, protecting against some of the negative effects on the stomach from tannins in the tea, according to the Ageless website. Tannins can also interfere with absorption of calcium and iron. Taking blackberry tea with milk helps to neutralize its effect on calcium and iron absorption. Adding lemon, which contains vitamin C, also helps to increase iron absorption. Don't drink blackberry tea at the same time as meals. Low calcium levels could lead to bone disorders such as osteoporosis; low iron levels can cause anemia. Signs of anemia include pallor, weakness, low energy levels and shortness of breath on exertion. 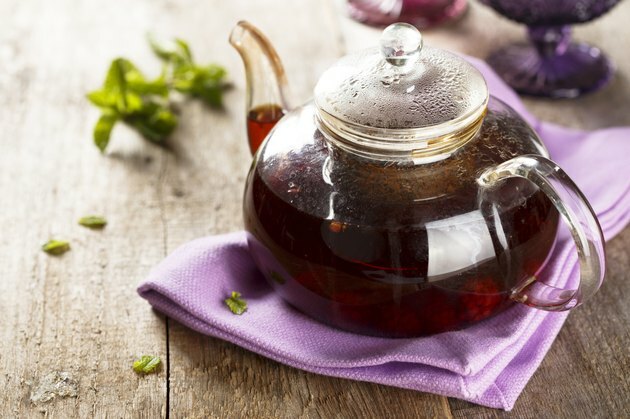 Although the evidence is purely anecdotal, according to the Ageless website, alternative practitioners may use blackberry tea as a uterine tonic. Raspberry leaf is used to ease labor pains. Substances that tone the uterus can cause uterine contractions. Talk with your doctor before drinking raspberry tea if you're pregnant, since uterine tonics taken in large amounts could possibly cause miscarriage or preterm labor.